A: A bright golden-orange haziness looks good in the vessel, a medium fogginess shall I say, with some back lighting getting through. An dull white eggshell white head forms and sticks well to the walls, sticking around long enough to leave a good deal of lacing. The head has a bubbly texture to it, while a medium, slow rising rate of effervesce moves within. S: Fresh peaches on the nose, along with some wet citrus that is very clean and defined. Some lemon-lime accents come through along with a fruitiness of pineapple and wet pears. Moderate strength overall with some dry whole grains finishing out. T: The flavor was strong orange peel from the start, along with a semi-dry rate of citrus. Bittering tropical, pineapple and lime, with a bready and grainy bite. Good dry hop bite of orange citrus finishes out. The flavor is more lightly dry hopped then fresh and wet as most N.E.I.P.A's just to clarify. A dryness of pine-citrus hops round out. M; Nice showing of carbonation that is sharp and well defined on the mouthful. Good juicy resins add substance and body fullness, o.j. like. O: Good drinking by style, lightly dry hopped, leaning more towards bittering tropical then wet and fresh. Very good overall 3.75. 16oz can poured into a WilliBecher glass. Nice hazy orange color. 1/2" foam (I poured a bit too slow) settles to a lacy ring. Smells of citrus, orange with a bit of pine and sweetness. Flavor is tangy citrus, orange, a bit of pine and a hint of tropical fruit and pineapple. Nice pleasant bit of scratchy bitterness in the back of the throat when swallowing, but not a asphyxiating throat punch. Very nicely done NEIPA! I will definitely go to the tasting room to try this on tap! Pours a regular cloudy light orange, my can is citrus heavy aroma, taste is a bit bitter, orange, slight hoppy pine. It tastes different than most NEIPAs, but I enjoy it. Not too filling. Poured from a 16 oz can approximately 3.5 months old per date on bottom of can. Appearance - Light straw color. Light haze, but much clearer than most NEIPAs. Moderate white head dissipates quickly. Aroma - Low tropical hop aroma. Much lower than the best examples of the style. Light grainy malt aroma. Not a bad aroma, just not enough of it. Flavor - Moderate fruity, tropical hops. Hop bitterness is a little high for the style. One dimensional malt flavor, appropriate. Lingering bitterness. Strangely, a retronasal impression of lager yeast on swallowing. Mouthfeel - Not juicy or creamy. Actually fairly dry. Moderately high carbonation. Just on the low side of medium mouthfeel. Overall - An outlier compared to the most popular examples of the style. Low aroma, high bitterness, too dry with a light mouthfeel, too clear. No off flavors, and what aroma and flavor are in there are vaguely reminiscent of a NEIPA, but, just not enough. L: Cloudy light golden pour. 2 fingers of fluffy white head leave a nice ring of lacing. S: Grapefruit and tropicals. NEIPA all the way. T/F: Crackery malts and tropical hops. Resinous... light pine, but citrus and fruit forward. Lighter melon and mango. Creamy carbonation and mouthfeel. Light and crisp. O: A damned good NEIPA. Very drinkable and with great flavor. Had just a taste of a draft of this that I was worried would not be fresh enough. No worries, it was totally fresh. Nice hoppy NE style aroma along with a tangy, over hopped taste. It totally works. 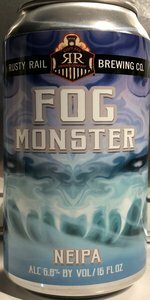 Rusty Rail Brewing Company "Fog Monster"
Notes via stream of consciousness: Nice label! That fog is kind of scary! Let's see how scary the beer looks... not scary at all. It's on the verge of becoming "cloudy" like a hefeweizen but still somewhat in the "very hazy" arena. It's a light yellow gold beneath a finger-thick head of bright white foam. Nice. The aroma is fairly limited, no, make that quite limited - at least given the style - but there is some citrus, citrus pith, and mild tropical fruit to it. Hmmmmm. On to the flavor... well that's more like it, there's plenty of tropical fruitiness there. I wouldn't call it "juicy" but it's on the way there. Some sweetish, basic malt supports it, and not even halfway through a bold bitterness rises. It's a bitter, very dry finish that just keeps going. The hoppy fruitiness holds on for a moment after the swallow but then fades, leaving it just bitter. The can lists it as 68 IBUs but I'm sure it's higher than that. I'm guessing 68 is a calculated IBU, not one that's been tested, but even if I'm wrong that doesn't matter, it appears more like 86 IBUs and I feel it's too much, it's not balanced anymore. On the other hand, some people like that brash bitterness, and there are no guidelines to the New England IPA style, and in my opinion, not even a concise agreement on what exactly that style is - and there are several as I see it. Looking back the head has dropped but maintains a solid surface covering, and the lacing is pretty good, I have to give it credit there. The mouthfeel is pretty good as well with a medium to medium-light body and gently crisp carbonation. Overall it's not bad, there's something there, but the lack of a strong hop aroma and an imbalanced bitterness drag it down. I'll wait until I'm absolutely sure they've brewed and canned this again before I give it another shot. This is very nice and full of hoppy aromas NEIPA but with a flavor profile that is mostly bitter and less complex than the nose would suggest. A very enjoyable beer however that is nice to pair with food or to quench thirst with. Nice mouthfeel with little carbonation. Poured into a small, half pint glass: color is straw, a bit clear for a fog monster, but not out of style, just maybe out of sub-style; head is bright white with fine bubbles. Aroma is pithy citrus, light toasted malt, some other light tropical notes. Taste is more citrus pith, maybe some more distinguishable flavors - some orange and lemon with grapefruit; additional light pineapple; malt is subdued with just a hint of light toast. Mouthfeel bitter with hop bitterness presenting and lingering on the tongue - a bit more than anticipated from the strength and sub-style. Overall a fairly good, easy drinking IPA with some NE qualities.